This is the doll display cases category. In this category, you will find many different kinds of doll display cases, such as Barbie Doll Display Cases, American Girl Display Cases, Beanie Baby Display Cases, Plush Doll Display Cases, Bobble Head Display Cases, Bobber Head, Display Cases, Bobbing Head Display Cases, Porcelain Doll Display Cases and Action Figure Display Cases. Scroll down for squared edge & hexagon glass doll cases. CLICK ON ANY CODE TO VIEW THE ITEM DESCRIPTION. 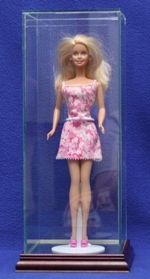 Plastic doll display case with a REMOVABLE built in stand and black base. access to the doll. Price includes 1 free nameplate. Ships flat. Assembles in less than a minute with no tools.